Here’s the understatement of our time: Yesterday’s supply chain was not set up for today’s shopper. As a supplier, you may already realize that shoppers’ demands and technology’s evolution change so fast that your supply chain struggles to even keep up. It’s a challenge that Kerry Bailey, Director of Retail at Menasha, and his team help suppliers with each week. As we begin a new series of articles with Menasha, we’re focusing on details of the supply chain process, how it’s changing as the shopper changes, common issues, and how suppliers need to prepare. We’re beginning with an overview of the current state of supply chain and how Kerry and team are helping suppliers adjust their processes to meet the new demand. Future articles will drill down further into individual issues and solutions through each link in the supply chain. When we talked with Kerry earlier this year, he detailed the parallel timelines a supplier faces once they get a “yes” to work with Walmart. Just recently, when we spoke on the 8th & Walton Conference Call podcast, he gave us a laser focus on the current and future issues of supply chain. In his experience of working with suppliers, Kerry gave intriguing insight on where the breakdowns lie and how to prepare for what’s next. Where Do Most of the Supply Chain Issues Begin? This is where many seasoned, well-established suppliers are at a disadvantage. The industry changed without the foresight of the supplier. The new demands are sometimes incompatible with the old formulas. As Kerry explains, that all adds pressure on the business and the product. What Are Suppliers Missing as Demands Change? As with many things in retail, striving to improve one area may unexpectedly harm another. It’s a reality Kerry and the Menasha team find in working with suppliers as the industry quickly changes. “One of the blind spots we’ve discovered is the impact of today’s speed of the supply chain,” he says. New rules brought the need for a faster process, but as Kerry explains, the product got caught in the middle. 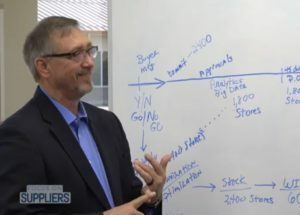 “Walmart Suppliers are familiar with the condensed On Time In Full (OTIF) requirements and the speed at which goods are being manufactured, put into distribution, and moved logistically. The impact of that is how the survival rate of a package is really changing. How Does Supply Chain Efficiency Impact Brand? “Brand” is such a marketing focus that you rarely hear it referenced in talking about the logistical supply chain. But as Kerry looks at the process end to end, brand has to tell the complete story. Without a streamlined supply chain, the supplier’s brand can become a bad story for the customer. “It’s a consumer’s world; the shopper has all the control,” Kerry says. “It’s about choice, reflection, and having a piece of their heart, you might say, in a brand world. As we work with brands today, we’re talking about the integrity of their brand. They have to tell a true story to the shopper. Weak link in your supply chain? It helps to get a fresh set of eyes on your process, packaging, and brand. 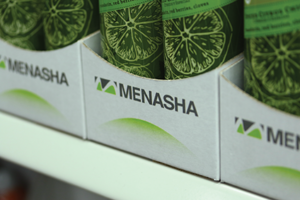 A partner like Menasha can evaluate your process and provide new insight on getting your product in the shopper’s cart. This entry was posted in Supplier tips and tagged Menasha, Menasha Packaging, Supply Chain, Walmart, Walmart Supplier, Walmart Suppliers. Bookmark the permalink.